Hello, and welcome back to our blog here at Felix Loeb. 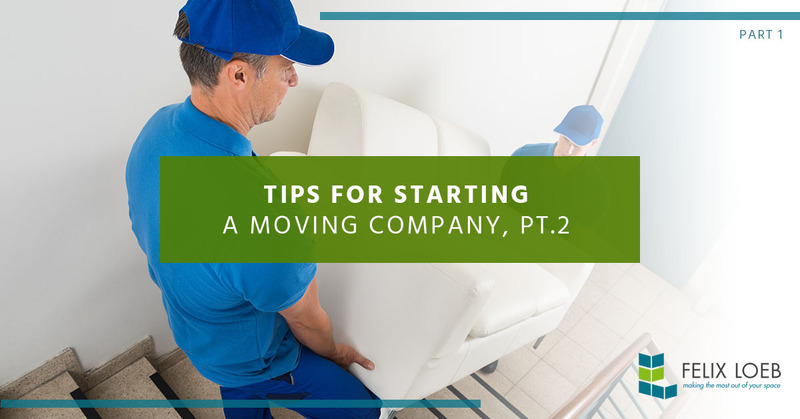 If you recall from last time, we talked about some helpful tips for starting a moving company. This time we’ll talk about several more helpful tips. In the meantime, if you need resources for your moving warehouse, don’t hesitate to contact Felix Loeb. We have material handling, hand trucks, wire shelving, pallet racking, safety equipment and much more. It’s great to have a few loyal customers, but if you aren’t investing in marketing, you aren’t going to get your company’s name out there. Most startups get most of their new clients through word of mouth and references, so you should plan on developing a close relationship with those that pay for your services. One of the most powerful marketing techniques for new startups is simply sending a follow-up email not just to see how their experience was with your company, but to see if they would recommend your business to a friend. This is the perfect opportunity to start improving your company from the very beginning and making it more appealing to customers who are often able to choose between hundreds of moving companies in the area. What makes your company stand out? For a moving company, every review is important. If you were running an e-commerce business that shipped products all over the country, chances are, it wouldn’t be too hard to shake off a bad review or negative customer experience. However, with a moving company, you’re operating in a limited area and just a few bad reviews can quickly ruin your reputation in the area. When you’re just starting, your focus should be entirely on creating happy customers who will give you positive reviews, even if it comes at a loss to you. Like I mentioned before, many people who are moving are looking for a full-service moving company who won’t have a problem storing their belongings for a week or two while they move into their new home or office. On your end, this may complicate things a little. It’s difficult to gauge how much warehouse space you will need because you don’t know how many people will be asking for storage solutions. The great news is, there are resources out there to help you turn a small warehouse into a viable storage area. At Felix Loeb, we offer many different racking options so you can store vertically and save space. This is crucial when you’re starting a moving company so you don’t have to invest in a huge warehouse to handle your customers’ needs. Are you ready to equip your warehouse with the most efficient and high-quality storage products? At Felix Loeb, we offer everything you need to save space in your warehouse while at the same time, making it easily accessible so it can be transported easily to its next destination. If you’re starting a moving company, contact Felix Loeb and we’ll help you run your business effectively.